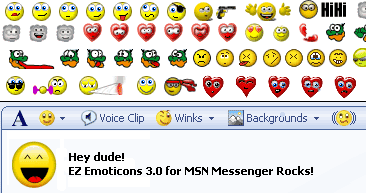 EZ Emoticons, the popular MSN Messenger Emoticon add-on that allows you to use hundreds and hundreds of emoticons without remembering shortcuts, is now back and better than ever before! Version 3.0 now completely supports MSN Messenger 7 and MSN 7.5, including Animated Emoticon Preview and Large emoticons and much more! EZ Emoticons, as the name suggests, is easy to use. You simply press Control + Spacebar on your keyboard while in an MSN Messenger conversation which will bring up a window with all your emoticons, and then click on the emoticons you wish to use and they will be automatically inserted into your message! This means you can use as many emoticons as you like without remembering a single shortcut! You can find a download link and some screenshot below. Limit of 300 emoticons removed - now supports unlimited emoticons! Emoticon list now previews animated emoticons! Improvements to the Emoticon List popup such as tooltips, scrollbar and more. Improved positioning of Emoticon List, AutoStartup, Minimizing/Maximizing and saving of email address. Less than a minute to download on a 56K connection. Want to know what EZ Emoticons looks like in action?